Now they renovated, and moved into a shop with ample seats, and lots of new stalls. 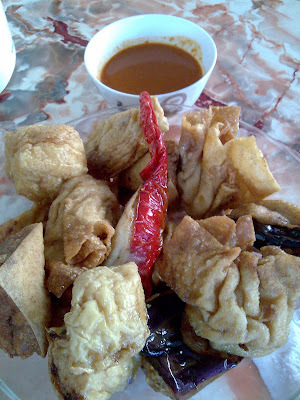 The rojak still stays, as is the Fried “Liew” stall, but the rest dunno where they mushroomed from. Each piece is STILL 50cents, and fried on the spot. On weekends noon, be prepared for long queues. I chose to go earlier, roughly before 12pm, to be able to choose my fav pieces, rather than simply choosing leftovers/the same type of newly fried batches. Their fish paste is VERY tasty, and lack the typical processed fishy smell.Portion is quite generous too. You can opt for noodles/laksa to go with the Liews, but normally i dun, to save time, haha …. UPDATED! 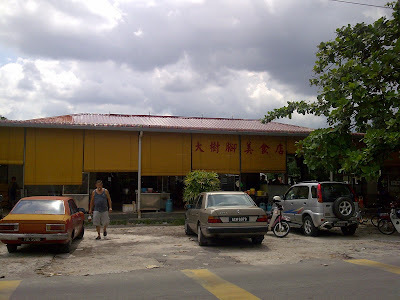 : It’s at Jalan Pasir Pinji, 31650 Ipoh. The opposite shop’s name is Sin Seng Kee Coffee Shop.